Super close to the amazing Jema El Fna market. This Riad was slightly tricky for us to find at first because it didn't have a lot of signs. We had a lot of luggage and this Riad is deep inside old town where no cars are allowed. But everything after that was awesome! This Riad is in a little alley with cute street kittens, and super close to the big Jema el fna and other markets and souks. So we can come in and out of our place throughout the day. The included breakfast is epic with crepes croissants etc. The rooms are grand with tall ceilings, really beautiful. We can imagine the family that used to live here before it got converted to a hotel. 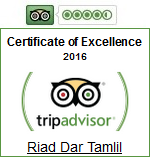 I stayed a total of 4 nights in Riad Dar Tamlil and overall we had a positive experience. Abdul, one of the staff guys, welcomed me and my girlfriend with a smile and gave us some useful tips and a bot of history about the city. It's not the best Riad in Marrakech, but they have fair prices for the location and service they provide. Might not be easy to find at first (as all Riads in Marrakesh) but once you know where it is, you won't have a problem. Just a couple of minutes out of the main city square. Since it's a small Riad (about 4 rooms if I'm not mistaken) you have a more personalized service, which is good. If you want a budget quality place, I would recomend this place. Deze riad is zeker een aanrader. Vlakbij het plein, dus alles is in de buurt. Eigenaren zijn heel vriendelijk en behulpzaam en spreken goed Engels. Het beste begin van de dag is met een vers ontbijtje op het dakterras. Goede prijs kwaliteit verhouding.